We are a leading Wholesale Trader of ph tester 98103, ph tester 98106, ph tester 98107, ph tester - 98108, plus ph tester-98113 and ph/temperature tester - 98127 from Vadodara, India. 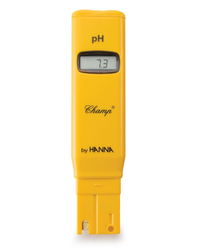 The pH CheckerÃ‚® series supplies users with fast and accurate readings from 0 to 14 pH with a resolution of 0.01 pH. 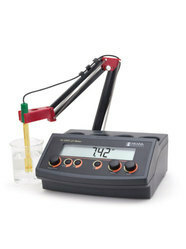 This compact pH meter features an easy-to-read LCD and simple to perform two-point calibration. The pH electrode of the CheckerÃ‚® can be easily replaced. You only need to unscrew the electrode from the meter body and screw on a new one. The CheckerÃ‚® is fast, accurate, lightweight and with 3000 hours of battery life, you no longer have to worry about frequent battery replacement. The pH CheckerÃ‚® series supplies users with fast and accurate readings from 0 to 14 pH with a resolution of 0.01 pH. 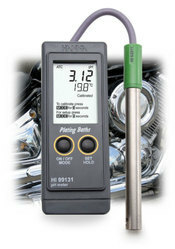 This compact pH meter features an easy-to-read LCD and simple to perform two-point calibration. The pH electrode of the CheckerÃ‚® can be easily replaced. You only need to unscrew the electrode from the meter body and screw on a new one. The CheckerÃ‚® is fast, accurate, lightweight and with 3000 hours of battery life, you no longer have to worry about frequent battery replacement. HI98103 (CheckerÃ‚®) is supplied with HI1270 pH electrode, batteries and instructions. Champ® pHep pH Tester revolutionized the pHâ€ˆindustry by providing non-technical personnel with a simple, inexpensive solution to accurate pH measurement. The HI98106 is used by millions of people around the world to monitor pH in laboratories and industrial applications as well as in agriculture, fish farming, food manufacturing and quality control, swimming pools and the printing industry. With a renewable cloth junction, the Champ® has an extended life over typical pH testers. A normal junction clogs with use over time and a typical tester would normally have to be thrown away once the junction is too contaminated. HI98106â€™s junction is 2 cm long and when dirty, can be pulled out to expose a fresh section to effectively renew the life of the tester. Calibration is performed manually at one point with a trimmer located on the side of the tester. HI98106 (Champ®) is supplied with protective cap, calibration screwdriver, batteries and instructions. 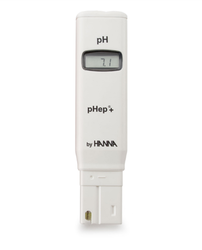 The pHepÃ‚® pH tester revolutionized the industry by providing non-technical personnel with a simple, inexpensive solution to accurate pH measurement. The pHepÃ‚® pH tester revolutionized theÃ¢â‚¬Ë†industry by providing non-technical personnel with a simple, inexpensive solution to accurate pH measurement. The HI98107 is used by millions of people around the world to monitor pH in laboratories and industrial applications as well as in agriculture, fish farming, food manufacturing and quality control, swimming pools and the printing industry. With a renewable cloth junction, the pHepÃ‚® has an extended life over typical pH testers. A normal junction clogs with use over time and a typical tester would normally have to be thrown away once the junction is too contaminated. HI98107Ã¢â‚¬â„¢s junction is 2 cm long and when dirty, can be pulled out to expose a fresh section to effectively renew the pHepÃ¢â‚¬â„¢s life. Calibration is performed manually at one or two points with a trimmer located on the side of the tester. With a battery life of 700 hours of continuous use, the pHepÃ‚® will provide years of testing before the batteries need to be replaced. HI98107 (pHepÃ‚®) is supplied with protective cap, calibration screwdriver, batteries and instructions. The pHep®+ pHmeter revolutionized the industry by providing non-technical personnel with a simple, inexpensive solution to accurate pH measurement. The 98108 meter is used by millions of people around the world to monitor pH in laboratories and industrial applications as well as in agriculture, fish farming, food manufacturing and quality control, swimming pools and the printing industry. With a renewable cloth junction, the pHep® has an extended life over typical pH testers. A normal junction clogs with use over time and a typical tester would normally have to be thrown away once the junction is too contaminated. HI98108’s junction is 2 cm long and when dirty, can be pulled out to expose a fresh section to effectively renew the pHep’s life. Calibration is performed manually at one or two points with a trimmer located on the side of the tester. Temperature is automatically compensated for with the integrated temperature sensor. With a battery life of 200 hours of continuous use, the pHep® will provide years of testing before the batteries need to be replaced. 98108 (pHep®+) is supplied with protective cap, calibration screwdriver, batteries and instructions. PICCOLO® plus is a revolutionary pH meter with a 4-in-1 amplified electrode. Conventional pH meters are susceptible to the weak, high impedance signal which makes the electrode, connector, cable and meter vulnerable to noise, humidity and dirty environments. PICCOLO® plus has overcome these problems with a pre-amplified electrode delivering a strong signal to the meter. The interchangeable electrode is inexpensive, rugged and houses the pH sensor, reference system, temperature sensor and the amplifier module. HI98113 (PICCOLO® plus) is supplied with HI1295 amplified electrode with temperature sensor, pH 4.01 and pH 7.01 buffer solution sachets, calibration screwdriver, batteries, rugged carrying case and instructions. 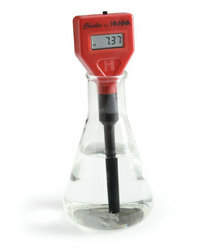 The pHep®4 is a waterproof pH tester with a 0.1 pH resolution and an accuracy of ±0.1 pH. It has many advanced features that are found in more expensive portable instrumentation. One or two-point calibration is automatic to two selectable buffer sets (4.01, 7.01 and 10.01 or 4.01, 6.86, and 9.18). The pHep®4 also features a replaceable electrode with a stainless steel round connector. This cartridge design has no pins to line up or that can break. The HI73127 replacement pH electrode also features an extractable cloth junction. The extractable cloth junction of the HI73127 allows for the renewing of the junction. Simply extract ” of the junction by pulling on the junction will expose a new portion. Any clogging that was present will be cleared and the response time will be back to normal extending the life of the pH electrode. Alerts user to potential problems during calibration including when to clean electrode and possible buffer contamination. HI98191 is supplied with HI72911B titanium body pH electrode, HI7004M pH 4.01 buffer solution (230 mL), HI7007M pH 7.01 buffer solution (230 mL), HI700601 electrode cleaning solution sachet (2 x 20 mL), 100 mL plastic beaker (2), 1.5V AA batteries (4), HI92000 PC software, HI920015 micro USB cable, instruction manual, quick start guide, instrument quality certificate, and HI720191 hard carrying case. One or two-point calibration is automatic to two selectable buffer sets (4.01, 7.01 and 10.01 or NIST 4.01, 6.86, and 9.18). Ordering Information HI991001 is supplied with HI1296D pH probe with internal temperature sensor, HI70004 pH 4.01 buffer sachet (20 mL), HI70007 pH 7.01 buffer sachet (20 mL), HI700601 electrode cleaning solution sachet (2 x 20 mL), batteries, instructions, and rugged carrying case. HI99131 is supplied with HI62911D pH probe, HI70004 pH 4.01 buffer solution sachet (20 mL), HI70007 pH 7.01 buffer solution sachet (20 mL), HI700661 electrode cleaning solution sachets (2 x 20 mL), batteries, instructions, and hard carrying case. Simple User Interface - Operation is simple with limited features that only require the use of several front panel knobs. Readings are easy to view on the large, clear display. One or Two-Point Calibration - Manual calibration can be performed at 1 or 2 points on the HI2209. This simple feature allows demonstration of the concepts of offset and slope. 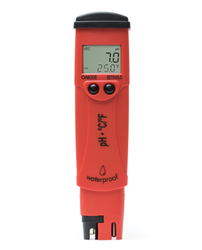 The HI2209 can be calibrated to any value within the measurement range of 0.00 to 14.00 pH. HI1332B pH Electrode - The HI2209 is supplied with the HI1332B plastic PEI body, double junction pH electrode with an indicating sensor made of General Purpose (GP) glass. The durable body and GP glass design allows the HI1332B to be used in a wide variety of applications, from chemical samples to field use and quality control. Temperature Compensation - Manual temperature compensation provides the ability to demonstrate the effect of temperature on pH measurements. Manual correction for temperature with the HI2209 is simple to use and allows for temperature corrections ranging from 0 to 100°C based on the sample being tested. Built-In Solution Holders - The HI2209 benchtop meter features solution holders built directly into the casing. This convenient feature saves valuable benchtop space and maintains solution bottles in an upright position, avoiding any potential spills. HI2209 is supplied with HI1332B pH electrode, 12 VDC adapter, and instruction manual. 9124 is supplied with 1230B pH electrode, 7662 temperature probe, 70004 pH 4.01 buffer solution sachet, 70007 pH 7.01 buffer solution sachet, 100 mL plastic beaker, batteries, instructions and hard carrying case. 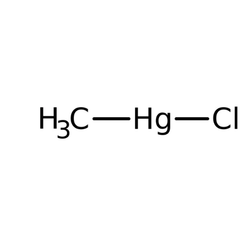 We are one of the leading manufacturer and supplier of Methylmercury(Ii) Chloride We obligated to mee the quality standards as per the customer demand. chintan enterprise is proud to introduce the worldâ€™s most innovative pH meter edge®. edgeâ€™s groundbreaking design is the culmination of Hannaâ€™s vision, design capabilities, integrated production and world class R&D. The edge meter is only 0.5â€ thick yet rich in features to accommodate the needs of a vast amount of customers. For those that prefer very simplistic operation there is a basic mode operation with simplified menu and options while for those who require advanced features there is the full featured standard operating mode. The edge HI2030 EC/TDS/Salinity kit can can be upgraded at any time with additional probes to measure pH or Dissolved Oxygen. edge features a 5.5â€ LCD display that you can clearly view from over 5 meters. The large display and itâ€™s wide 150° viewing angle provide one of the easiest to read LCDs in the industry. Analog Output - The 22091 benchtop meter features an analog output that allows connection between the meter and a recording device. One or Two-Point Calibration - Manual calibration can be performed at 1 or 2 points on the 22091. This simple feature allows demonstration of the concepts of offset and slope. 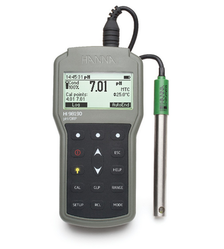 The HI22091 can be calibrated to any value within the measurement range of 0.00 to 14.00 pH. HI1332B pH Electrode - The 22091 is supplied with the 1332B plastic PEI body, double junction pH electrode with an indicating sensor made of General Purpose (GP) glass. The durable body and GP glass design allows the 1332B to be used in a wide variety of applications, from chemical samples to field use and quality control. Temperature Compensation - Manual temperature compensation provides the ability to demonstrate the effect of temperature on pH measurements. Manual correction for temperature with the HI22091 is simple to use and allows for temperature corrections ranging from 0 to 100°C based on the sample being tested. Built-In Solution Holders - The HI22091 benchtop meter features solution holders built directly into the casing. This convenient feature saves valuable benchtop space and maintains solution bottles in an upright position, avoiding any potential spills. 22091 is supplied with 1332B pH electrode, 12 VDC adapter, and instruction manual.